If you've read the recent report from The Horse magazine, you know that collagen II is showing promise for horses with arthritis (see article "Collagen shown more effective for arthritic horses"). This article reports on a study that appeared in the Journal of Veterinary Pharmacology and Therapeutics. Bottom line, collagen II seems to be significantly more effective than glucosamine/chondroitin in treating equine arthritis. If you're wondering what joint supplements contain collagen II, I have found *two: Grand Meadows Grand HA ($1.33/day, 1,000mg/oz) and Nimble Supreme ($1.58/day, 600mg/oz). Problem is, I already use glucosamine/chondroitin supplements, Absorbine FlexMax ($1.39/day) and Smartflex Senior ($1.13/day). I don't need yet another one, and I don't want to switch to something I haven't tested out. I found this bulk product from SupplementDirect, undenatured Collagen II, 100 grams for $30 (includes shipping). I checked around some weightlifting forums and found that a lot of body builders use that company. So I bought it! The Journal of Veterinary Pharmacology and Therapeutics study showed good results for horses getting 320, 480, or 640 mg/day -- with 480 being the optimal dose. 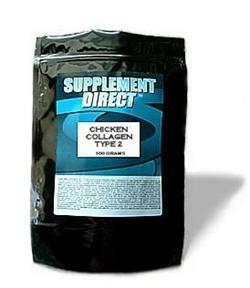 The Supplement Direct collagen contains 100 grams. My math skills are pretty poor but I think with a 480-500mg dosage that's 15 cents/day. The bag even comes with a 250mg scoop -- what more could I ask for? *Another brand with type II collagen is Actiflex -- 3,000 mg/oz? Has anyone ever used it? What's the difference between active type II collagen and inactive collagen? When you're talking about undenatured collagen, you expect about 25% of the weight in milligrams to be "active" (which I think means absorbable). A 320mg dose of type II collagen would have about 80 active mgs. What is undenatured collagen vs. denatured collagen? Denatured, or hydrolized collagen has been processed with high heat and/or chemicals. These processes alter the molecular structure of the protein, rendering the it ineffective as an immunomodulator. There are no peer-reviewed scientific studies showing that denatured type II collagen provides any joint health benefits. Undenatured type II collagen is made using little or no heat and very limited processing - just enough to concentrate the collagen and make it soluble. The UC·II manufacturing process ensures that the collagen remains biologically active in its most native, triple helix form, with its immunomodulating ability intact. How do I know the collagen I buy has the active ingredients and formulation that will help me or my horse? Suprise! You DON'T. Welcome to the unregulated world of supplements. Unless the manufacturer voluntarily submits samples to Consumer Labs or the NASC, you can't really be certain what you're getting. And if you read Consumer Reports nutraceutical reports, you'll be dismayed to see that paying a lot of money is far from being a guarantee of quality. In some cases dollar store brands outperformed products sold at 4-5 times the price! Wow, thanks for doing all the hard work I was planning on doing tonight! Seriously, this sounds like a real boon, especially for those arthritic IR horses that have problems with the glucosamine. Haven't used any of those products, but I surely will look into it. I'll be interested to read any other comments on this one. It looks like the denatured collagen product used in the Gupta research study is different from the Supplement Direct chicken collagen product. In the study, the authors specifically state that the product they used contained "80, 120, and 160 mg active UC-II, respectively". UC-II is an actual patented product made by InterHealth USA and contains 25% of the active form of undenatured collagen. I'm not convinced that the Supplement Direct version contains the same quantity of active ingredient. You can only buy the "real" InterHealth UC-II in capsule form and would have to give 12 caps per day to feed the same level that was found effective in this study. Here you can buy 60 caps for $17.49, so that would be $3.50/day....! At that price, it is hard to justify trying it, especially since the dosage of glucosamine/chondroitin they used in the study is about half of what experts recommend for horses (no wonder they saw a lower response). I looked up several of the human studies on this, and they all used the InterHealth UC-II product. The prelimiary results of this study do seem promising and it is still an interesting topic for discussion...even if it is simply a reminder to remain "critically objective" when evaluating research studies! Sorry, don't think you are correct. InterHealth Nutraceuticals (Benicia, CA) and BioCell Technology LLC (Newport Beach, CA) are two of the major players in the collagen market. Grand Meadows and Nimble horse supps use the Biocell manufacturer, there's nothing magical about interhealth. I think we're just talking about different manufacturers and possibly patented production processes, something very common in supplements. The cost difference could easily be the encapsulation process. Finally, many many of the equine supplement studies of glucosamine use Cosequin, but that doesn't mean the ONLY useful form of glucosamine is from that manufacturer. Keep us posted if you hear anything more. I'm very interested in trying something new for my fella. Oh, and to explain the statement "the authors specifically state that the product they used contained "80, 120, and 160 mg active UC-II, respectively"
Undenatured type II collagen (processed in low heat as opposed to hydrologized which uses high heat) has a certain percentage active ingredient, typically about 25% of the actual weight in mgs. You'll see this stated in articles about collagen II in general, not just Interhealth or Biocell. The amounts 80, 120, 160 corresponds pretty well with my statement about the actual dosage of 320, 480, or 640 mg/day. What IS true is that no one regulates or does quality control on these types of supplements -- so technically any of these manufacturers could be selling a lot less than we think we're getting. Supplement Direct has a good reputation in the body building community, and at that price, I'll take a chance. I have body builder friends and they have bought from Supplement Direct. Body builders are the type of people that are going to pay good money for good quality. So, there are 2 primary manufactures of chicken collagen....got it. But the fact that all of the published (human) research uses the UC-II product manufactured by InterHealth remains. Perhaps the difference in efficacy (and price) does lie in the manufacturing process, which somehow concentrates the active ingredient or protects it, making it more bioavailable...on the label you would not be able to tell the difference. It is sort of like horse feed: you can have 2 bags of a "performance horse feed" that are both guaranteed at 12% protein, but one product costs $8/bag and contains cottonseed meal with no essential amino acids, while the other costs $20/bag and contains soybean and alfalfa meal plus added lysine and methionine. They both are technically 12% protein, but the difference in protein bioavailablity is reflected by both the price and the response seen in the horse. Since Cosequin was mentioned, this is a good example (IMHO) where there is a difference from other joint products that may appear similar, due to the specific combination of ingredients and the bioavailable form of chondroitin sulfate that is used in Cosequin. Many joint products will list "chondroitin sulfate" on the label, but it is not identical (on a molecular level) to the specific type of chondroitin sulfate in Cosequin that has been shown in published research studies to be effective. So, based on scientific principles, you cannot conclude that glucosamine is effective based solely on studies that used Cosequin...Cosequin is a unique product, containing a blend of unique ingredients, and has a unique manufacturing process--which all contribute to its effectiveness. According to an article published on the Lubrisyn website, Biocell collagen was a bi-product of Hyaluronic Acid production (the type from rooster combs, which has a low molecular weight--and according to the article, is inferior to HA with a high molecular weight). I've used Actiflex in the past and it looks like it has high quantities of active ingredients at a reasonable cost. I found that it was just as effective as other joint supplements I've used. Big D Web has a promo on Actiflex 4000 in which you can get a gallon for $82.95 and can get a quart free which works out to less than 52 cents per serving (with the glucosamine, chondroiten, MSM, collagen and the rest of the ingredients.) I've been buying my supplements in bulk & mixing myself, but after hearing the collagen angle, I may just go back to Actiflex. Harv gets joint supps to help with his creaky old bones -- it seems to help, but then so does the 1g bute/day! Riley? I think a young horse starting work might be experiencing some aches and pains, plus he's such a big guy he could probably use a bit of joint support. A lot of these products offer some benefits to the hoof capsule too. Intersting discussion. I trust you'll keep us in the loop on your results! And I just want to add, kudos to you for an intellegent, relevant, well-researched blog! It is appreciated. Supplements! My favorite topic! I am actually a huge supporter of the Adeptus Nimble Supreme. Main reason being that is works wonders for all the horses in our barn in addition the founder Dr. Wilson. She spent an hour on the phone with me talking about different ingredients, manufacturing processes, science behind the nutriton etc. The Nimble Supreme imo is the best out there. Higher amounts, and quality, than all other companies and her chondroitin sulfate is actually a lower molecular weight than cosequin. Side note on someone saying the lower molecular weight HA was inferior. If you are injecting HA or anyother joint supplement you want it to be high molecular weight. If you are feeding it you want it as low as possible. Another side note I've found in my reaserch (told you I loved supplements) was that MSM will over time block the cell receptor sites. That is why Collagen is the new/better way to give the horse a sulpher source. LOVE the blog. The time you put into research is amazing! Annie, I'll be blogging about supps a lot next week. Thanks for the info about molecular weights and oral supps. I seem to recall when my vet injected Harv's hocks directly, she said she used the lower molecular weight formula for the larger joints. But it's been years, maybe I'm mis-remembering. Good future blog topic if I ever learn enuf to write about it. Already i have use some other collagen product . If try this products is this cause ant side effect. your journal comments terribly nice, therefore see the my journal comments is extremely helpful for to any or all..